Management of public forests by the forest industry isn’t in the public interest. 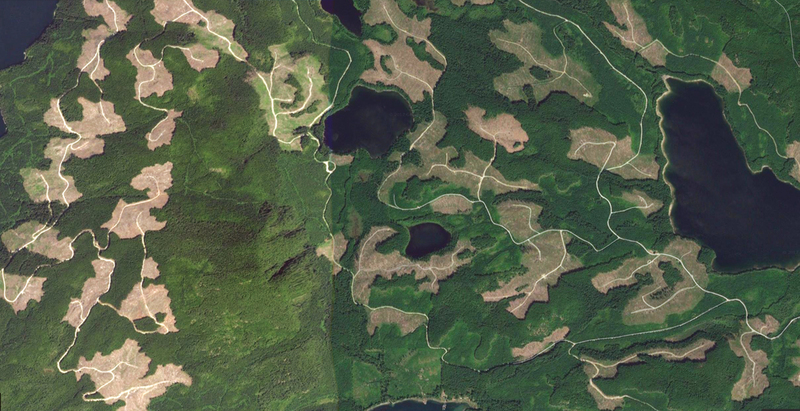 BC’s forests have become a vast patchwork of roads, clearcuts and mainly young trees. Of the latter, critics say, there has been no reliable inventory. As well, the Province has relied less on its own scientists and more on forest industry professionals to conduct management of public forests, blurring the distinction between public and private interest. FORMER GOVERNMENT FOREST SCIENTIST Andy MacKinnon’s battle cry, as he knocks on doors as a Green Party candidate in the upcomming provincial election, is: “Wake up British Columbians!” He’s one of an increasing number of scientists who are getting into politics to raise the alarm about what happens when proper government oversight is put at risk through budget cuts and political interference. It appears to be. The 64-question survey was circulated to 1159 government scientists this past November, with most of the responses coming from the Ministry of Forests, Lands and Natural Resource Operations (FLNRO). The report provides the historical context for the survey, which includes the dramatic reduction of provincial staff-scientists starting in 2001. BC now has the smallest public sector per capita of all Canadian provinces, despite its wealth of natural resources. The biggest problem, according to Britneff, is the corrupt data and unreliable models for determining the inventory of the forests—known as the “Timber Supply Review”—that’s used by the Chief Forester to determine how much forest can be cut each year, the “Annual Allowable Cut” (AAC). But Britneff takes issue with Nicholls’ defence. He notes that “uncertainty” is a technical term used in the international accounting world when measurements “are based on estimates, judgments, and models rather than on exact depictions.” The absence of independent auditors to verify the data means there is no sound basis upon which to trust Nicholls’ numbers. Britneff and Watts also believe that the sensitivity analyses to which Nicholls refers are incorrectly applied. Remarkably, there is no legal requirement for Nicholls to conduct an actual inventory of provincial forests. That used to be a statutory responsibility of the chief forester, but changes to the Forest Act in 2002 transferred the inventory function to what was then called the Ministry of Sustainable Resource Management. When that ministry was disbanded, inventory staff returned to the Ministry of Forests and Range but the legal requirement to conduct inventories didn’t. It simply disappeared. Both Oversight at Risk and Britneff point to problems beyond the uncertain timber supply, including insufficient capacity and budget within the Ministry to do an inventory. There is also no legal requirement for foresters working outside of government to maintain their data and records. There is also evidence that a political agenda at least partially determines the Annual Allowable Cut. This is perhaps best illustrated by an historic directive issued in 2006 by then Minister of Forests Rich Coleman to “maintain and enhance” the timber supply. This directive is still in force and, in effect, means that the AAC would never go down. This approach has left towns like Merritt with no timber and a long wait until the trees grow back. But the growing record of scrutiny of professional reliance—by bodies including the Centre for Public Policy Alternatives, the Environmental Law Centre, and the Auditor General in his scathing 2016 report—suggests otherwise. Professionals aren’t able to look after the public’s interests when they have no legal requirement to do so; they are employed by the companies they are expected to monitor; and their professional organizations are not at arm’s length from the forest companies that employ them. Last year, only one disciplinary case was brought to the Association of BC Forest Professionals—and it was thrown out. The year before, five cases were brought forward; three were thrown out and two are still in play. Cases like the Mount Polley disaster, the green-lighting of the Site C project through exemptions of the Wildlife Act, and Elk River selenium risks are cited in the report as the most egregious examples of the failure of professional reliance, so the problem extends well beyond forest management. On the issue of being free to communicate their concerns to media, only 3 percent of scientists stated they could do so without approval from their bosses; 32 percent said that they were not able to communicate at all with media; 42 percent had to seek approval; the rest didn’t know. During my own 16 years of writing on the subject, no permissions have ever been granted to speak to a government scientist without public relations approval, even for data as seemingly apolitical as the population of black bears. WITH LITTLE ABILITY TO GET EVIDENCE, no jurisdictional oversight to even enforce against fraudulent activity, and little confidence that the current government wants to change the status quo, some scientists like Andy MacKinnon are turning to the political sphere. Yet, strangely, the management of public lands (94 percent of this province) is not a big election issue. Raw log exports have grabbed more attention, but their revenue impacts are small compared to the scale of the economic problems created by the diminishment of proper government oversight. NDP leader John Horgan, who comes from a forestry background on the island, released his party’s forestry platform in April. Aimed more at top-of-mind issues like curbing log exports and job creation, it doesn’t mention reforming the professional reliance system, raising stumpage, or bringing back the scientific research branch—not surprising because it is hard policy to explain. Briony Penn’s most recent book, The Real Thing: The Natural History of Ian McTaggart Cowan, won the Roderick Haig-Brown Regional Prize and the inaugural Mack Laing Literary Prize. seems when the professionals are hobbled and thretened by their superiors and not being able to voice their concerns and be a professional for the greater public good, there is no fairness and shame on the federal and provincial governments for strong arming these public servants who have the greater public awareness withheld by the upper management and upper government who want the public blind and ignorant. We grow up and try to instill these fair and just traits with our children and the governments train those under them to be conniving and not divulging all that is true. The norm is going out the window.